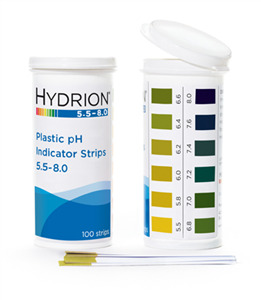 Conveniently packed in flip-top vials, these premium quality plastic pH strips offer excellent color separation in both the acid range (below pH 7) and the alkali range (above pH 7). Commonly used to test urine and saliva, it offers an easy to read, single color match at every .2 to .3 interval from pH 5.5-8.0. Each vial contains 100 strips. Minimum order of 3 vials. Also sold in cartons of 6 vials. 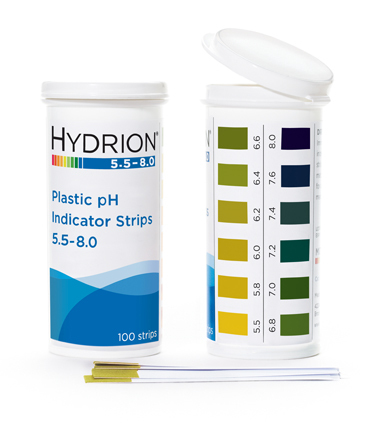 Simply dip the pH strip into the test solution, then instantly compare the resulting color with the matching pH color chart.